The Flipping Off Powder Measure Cover Problem! For safety reasons, it is a good idea to keep the top of your powder measure covered, but does the cover constantly pop off when snapping the measure's handle? If so, here's how to fix it. Most covers have a small raised area on the lip that fits into the main powder hopper. These areas eventually wear then no longer hold the cover. Simply shave these bumps off with a knife and drill a 1/8" shallow hole in the same location (don't go all the way through the plastic). Then place a drop of clear hot glue in each hole with enough above the plastic to hold the cover on. If the glue is a bit too thick, simply shave a little off. The externally adjustable/rezeroing feature of Forster competition seating dies is a nice feature (die on the right). Redding competition dies adjust internally so you are always hunting for the correct size allen wrench. If you remove the top of a Redding die you will see the only real difference is the screw used to "zero" the seating depth does not extend through the die head. Simply drill a larger hole in the head of the die and replace the short internal screw with a longer machine screw (or piece of all thread) and nut. If for some reason you want to change the die back to its original configuration, no problem. The slightly larger hole in the top of the die will not bother anything. This modification to the Redding die on the left happens to have a knurled nut off an old RCBS seating die. Here's how to throw charges directly into a scale pan without spillage. I have my powder measure equipped with a clear drop tube from Sinclair mounted over the bench so the end of the drop tube is about 1 1/2 inches above the scale pan. You must make a small modification to the drop tube to slow the powder down and eliminate spillage. Cut a strip of clear hard plastic from common packaging material (bubble pack) slightly wider than the inside diameter and 3 inches longer than the drop tube. Hold the ends of the strip with pliers and heat it with a hair dryer or heat gun. Just before it melts, but while it is pliable, twist the strip 2 to 3 complete turns and let it cool. Insert the twisted strip in the drop tube and trim to length. Use the small end plug and you will find even long tubular powder no longer bounces out of your pan! Too Many Presses & Gadgets? If you are like me, you have too many presses and gadgets that all need to be firmly mounted to the bench. With 8 presses and as many gadgets I would use up my work area if I kept them all mounted, and bolting/unbolting is such a pain. So, here's my fix. My bench top is made from three layers of plywood glued and screwed together. In three areas along the bench (strategically located of course) the top two layers have been cut out to provide an 8" X 10" recess at the front of the bench. The back and side of each recess has a top-flush "under cut" frame made from Oak on my table saw. The frames are firmly glued and screwed from the under side of the bench. Each recess can accommodate a 6 1/2" X 8 1/2" matching block that simply slides in from the front edge. Blocks are left attached to each device so all I have to do is slide a press or gadget into place and I am ready to go. And when not reloading, blocks fill the recesses so the bench is clear for other projects. The wood blocks are strong enough for just about any press work. On my Rock Chucker, used for forming brass, I simply reinforced the underside of the block with aluminum. Don't Throw Away Those See-thru Rings! If you have a set of unused see-thru rings laying around you can turn them into useful anti-cant devices for a fraction of the cost of commercial products. If the rings are "Weaver" type simply grind off & reshape the base to match the see-thru oval. Finish-sand the ring with some fine sand paper and paint it with gloss lacquer spray paint. Then head to your local Wal-Mart or Ace store for a $2 plastic torpedo level. Pop the large bubble out of the level and epoxy it into the see-thru oval. Now when you mount the ring "bubble up" on your scope, you will have a field-tough anti-cant device that also works at the range. I have my powder measures permanently mounted on a shelf above my bench and grew tired of screwing them loose just to dump powder. A simple modification works extremely well and does not affect the measure's ability to throw consistent charges. Purchase a brass double-male fitting with at least a 1/4 " hole and matching screw-on cap at your local hardware store. Then, make a plug to prevent powder from entering the fitting. To do this coat the inside of the fitting and cap with bedding compound release agent. Screw the cap onto the end of the fitting and back it off about 1 1/2 turn. Squirt the inside of the fitting with hot glue. To get a good casting you should insert the tip of the hot-glue gun as far into the fitting as possible, then withdraw it as the fitting is filled. Allow the glue to cool, remove the cap and push the plug out of the fitting. A good casting will be free of bubbles and flaws. 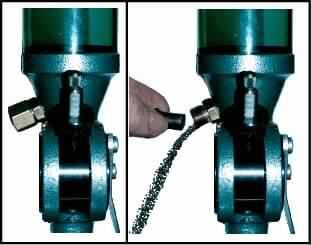 Remove excess release agent from the plug and coat the plug with powdered graphite (or roll it around in graphite coated gun powder). You should be able to easily insert or remove the plug from the fitting and secure it with the brass cap. Drill a hole in the measure to accept the fitting just above the cylinder on the side opposite the handle. On a Uniflow the metal in this area is only about 1/8 " thick and slants at nearly 45 degrees making it a perfect place from which to empty powder. File the end of the fitting that will be in the hole so it matches the inside shape of the measure and will not obstruct powder flow. Trim the plug so it will not extend into the measure. Epoxy the fitting into the hole in the powder measure, insert the plug and secure it with the cap. Now when you want to dump powder, simply unscrew the cap, place a powder canister under the fitting and remove the plug. Nearly all the powder will spill out. Insert the plug and a couple pulls of the handle will remove remaining powder. On of my favorite presses is the Forster Co-Ax. Its snap in die feature and jaws that eliminate need for shell holders make it a truly unique old design. Unfortunately if you are used to a conventional "C" or "D" ram press the Co-Ax does not seem "ergonomic". You cannot stand in front of the press, move your hand into it from the left side and pull the handle. Watch most people use a Co-Ax and they either step back and forth in front of the press or load with one hand. Here's something Forster should have done decades ago but you can accomplish with a hacksaw, drill and gas welding equipment. Make a replacement pivot arm for the left side of the press from a piece of 1/4" plate steel so you have "knuckle" room and can place brass on the press from the side. 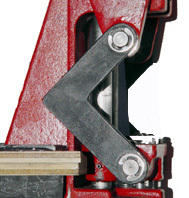 This modification does alter the geometry of the press or reduce its strength. Just hacksaw the "L" from a piece of plate steel then drill holes on the ends at exactly the same spacing of the original pivot arm. Then, fabricate an offset handle using similar metal tubing (available at many Ace Hardware stores). I used a gas torch to heat and bend the tubing and brazed it to a stub that goes into the top of the press. Now you can stand in front of a Co-Ax press, load it with your left hand and pull the handle with your right as you would a standard "D" press. 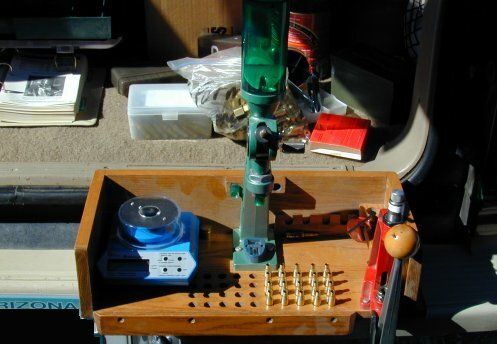 Rather than loading everything at home before going to the range build a loading box for your scale, powder measure and an inexpensive press. Then simply take some sized & primed brass, powder and bullets to the range for initial load development. Just throw charges and seat bullets as needed for initial load development. No more pulling bullets from loads that did not work or shooting up loads made at home just to get rid of them! I even made mine with a place to hold shell holders and extra seating dies. It sits on my back bumper or tailgate and can also be clamped to a shooting bench. If you are going to include a scale adding a bubble level will help the scale read the same in a different locations. I have learned it is a good practice to keep one unfired round of a good load so you can disassemble it when you get home to verify the powder charge and/or seating depth with your normal scale and press.